This article “celebrated” the Dublin Millennium madness and was first published in the Evening Press. It has two words: the first identifies the place and the second tells us it is one thousand years old. I absolutely refuse to use either of them. It is the Capital's greatest ever splurge of histrionic pageantry. Emblazoned with tinsel ritual, it requires of all participants the greatest degree of punctilious pomposity. Carmencirra* even got an honorary degree in it! We can't bring in the milk in the morning but they've stamped the bloomin' bottles with it. They have badges and stickers, flags and bunting, flower-beds and murals, paintings and tapestries, cups and cutlery, plates, jugs, candles, wallets, hats, coats, teeshirts, towels, umbrellas, postcards and even a special stamp, all ruined with it! You can't open your eyes in the morning but its there - on the buses and the DART, the taxis and the trains. Boats and planes are adorned with it. It's on car bumpers and back windows beside those infernal noddy dogs. There are shows and displays, films and plays, concerts and recitals, football matches, chess tournaments, exhibitions, competitions, schemes, projects and plans, all because of it. They're selling 88 gas cookers for 88 pounds to the first 88 people to answer 88 questions in 88 seconds. You must pay by cheque (no. 88 - naturally) and you must live in a house numbered 88. You must have lived there for 88 years and it must be your 88th birthday. Simple, isn't it? Pop in and get yours now - while stocks (and your patience) last. It's enough to turn a body all-electric. As for Michael Smurfit's private bath in the main thoroughfare, I can't express any feeling about it that would pass the sub-editor's watchful eye in a family publication. I am sick of it! Sick, tired and bored with the subject. And I know I am not the only one. I belong to the large and too long silent majority of innocent victims. We have had five months of the damn thing. I cannot suffer another seven. Let's take the place. They tell us that it is one thousand years since it got something or other - nobody is quite sure what! This supposes it was pretty well established at that time. One look around it now would tell you that it is not yet established. The locals, who think they are natives, all have grannies from the sticks. They speak in a dialect that couldn't be understood by any of us unfortunate enough to have been raised to speak in the English language. It's a sort of mix between cockney bearla and the Inisboffin blas of the vernacular, spoken at a hundred miles an hour when sober and in reverse after ten o'clock at night in any half decent pub outside the area known only as "four". Four is the old-age-Yuppie quarter of the city. The dreaded words are on the stamp! According to the census figures, there's about a million people in the place. But if you count all the civil servants from Kerry, publicans from Donegal, journalists from Cavan, builders from Mayo, more Corkmen than you would find in the whole of Munster, and all the other countymen from the four corners of Ireland living in the place, you would be left with about a dozen real full blooded natives. They have taken over our radio and tv, our newspapers and magazines. You can't turn a page or look at a screen without some yobbo telling you about the latest news of it. It took months for everyone to get the spelling right - two l's and two n's - and even now there seems to be no regard for good old English grammar. Please note: the adjective is "millesimal". Gay Byrne is in on it - by appointment, no doubt. Please Gay, give us the doctor who won't be happy 'till we're all hypochondriacs, or the mystery sound used by the mothers-of-ten to say hello to all their children and the hundreds of grand-children (by name) and the cousins in Australia (we'll send them the tape), or the sordid details of secret sexual affairs in far off rural places. You don't need this particular bandwagon - it's overloaded already. Is nothing safe from its global grip? As a redneck who has been obliged to help out the few real Jacks for nearly twenty years, I want to raise the voice of the oppressed majority. It's time to call a halt to the madness. It's time the truth was told and I will tell it. It's time the lid was blown. The fact is, the whole miscegenation was started by the printers. They are the beneficiaries of all the hype and promotion. They are the ones who make the bucks out of every object and event for the entire year. Look carefully, dear readers, and see what's going on around you. Everything connected with this infernal anniversary has a logo on it. And who puts this logo on it? Yes, that's right - printers! Hundreds of printers in tiny back-street printing works churning out millions of logos on everything from ties to toilet paper. History will recall it as the Great Printers' Plot of 1988. If we survive the year of this dreadful curse, I can only hope that it does not spread with infectious speed throughout the entire island. We have already had the Galway 500 and Cork 800. Perish the thought of what will be created by the commercial success of this madness. Like the festivals and their roses of the sixties, this could spread to every town and village in the country, culminating no doubt in one big national bash to celebrate the anniversary of the tectonic separation of the island from the rest of Europe. Rest assured, someone will be able to pinpoint the exact date of that too - and we'll believe it! 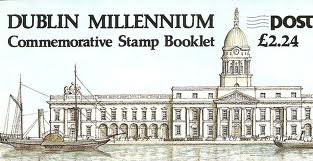 * Carmencirra: Carmencita Hederman was Lord Mayor of Dublin for the Millennium year. I am a freelance journalist in Dublin, Ireland, an award winning photojournalist and feature writer.